Try these tips to give yourself a lift when life is getting you down. Happiness is something we do rather than something that just happens so build some of these practices into your day to #GetMore good into life. Start with the ideas below, which are all known to grow happiness, and then plan your own playlist of mood boosters and do one thing from it every day, whether that’s going for coffee with a friend, or having a treat like a massage. What’s good in your life? What’s gone well? What are you grateful for? Just before bedtime sit down and write a list of your three good things for the day. Counting your blessings focuses your attention on the positives in life, which lifts the mood. We are wired to notice what’s wrong before we notice what’s right, so practiSing gratitude helps you tune in to appreciate the good things you have. A powerful mood booster is to savour positive experiences so that you squeeze all the juice out of them. Bask, marvel, relish, feast and luxuriate to maximise your enjoyment. First up you need to slow down and put your full attention on whatever you’re savouring so stop multi-tasking and switch the phone off. Then use all your senses to turn the volume up on the experience. In workshops I teach people how to savour with fruit – noticing the colour of a strawberry, its sweet smell, the crunch as you bite into it, the texture on your tongue and the full flavour of its delicious taste. You can savour the past – reminiscing over a happy memory or the future – relishing the excitement of something you’re looking forward to like a holiday. Ask yourself what is good about it? The number one source of happiness is other people so you can get an instant mood boost by reaching out to someone. Pick up the phone and speak to a friend you haven’t spoken to in a while. Write someone a thank you letter. Help someone out. Acts of kindness help both givers and recipients feel good, so you get positivity bouncing back and forth between you. It’s also a useful distraction from your own troubles. Green exercise is physical activity in a natural environment. It only takes a few minutes of walking in the woods or wild swimming to start generating positive emotions. Doing it by water has extra calming benefits for the mood. Find your nearest patch of green and get physical – go for a walk or do a few yoga stretches. Your strengths are your positive qualities, such as courage or kindness, and your talents – the things you’re naturally good at. What are you doing when you’re at your best? What do you have a gift for? Finding ways to use your strengths can help you perform better at work and grow your well-being. Your strengths are like levers that you can pull to help you reach goals and resolve issues eg. how can your strength in perseverance help you reach the goal of running 5k? When something goes wrong, try to find the positive in the negative. A Sunday walk that’s rained off becomes an opportunity to linger over the Sunday papers or curl up on the sofa with a box set. Look for the positive in what happens. On the other side of a negative is an opportunity to prioritise your needs, pamper yourself and have total control over the remote! What puts you ‘in the zone’? Flow is that state where you’re so completely absorbed in what you’re doing that you might lose track of time. People get into flow through hobbies like crafting or baking, doing something physical like gardening or jogging or creative like painting or jewellery-making. Try to set aside a couple of hours a week where you lose yourself completely in a flow activity. It’s a very satisfying experience. Make a list of 3 positive things that you expect to happen tomorrow and then relish the anticipation of them coming up. What is there to look forward to? Indulge in some day-dreaming and spend a few moments anticipating the positive feelings that you will get from it. By doing this practice regularly you’ll start to feel more optimistic and excited about what’s ahead. 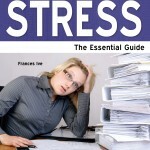 Stress has been a hot topic for years, and it’s not getting any better. People are even more stressed now and technology is making it worse. How many emails do you have to deal with each day? Do you get phone calls and emails wherever you are at any time of the day or night? READ: Heads Together to improve mental health awareness, a campaign spearheaded by the Duke and Duchess of Cambridge and Prince Harry. When I wrote the book Stress – The Essential Guide, the thing that became most obvious to me was how most people don’t really help themselves. We have so many habits and idiosyncrasies, beliefs and obsessions that we often do things in a way that make life much more difficult for ourselves. So I included a paragraph called Are You Your Own Worst Enemy? This is not meant to be harsh. If you have lost someone close to you, you or someone close to you is seriously ill, you’ve been through divorce, or lost your job you are more than likely to feel very stressed. But you do need to be good to yourself when this is happening. There are so many ways that we aggravate situations. • You might be a perfectionist – always wanting everything to be just so. • You may procrastinate – putting things off until they overwhelm you. • You may have been brought up with very strong beliefs or prejudices which don’t serve you well and mean you cannot accept certain situations. • Perhaps you are in denial and cannot face things, thereby making things worse for yourself. • Or maybe you are proud and don’t like to tell people when things are going wrong. • You might find it impossible to say no, even when you really don’t want to do something. • And similarly you are always doing things for other people, when you have plenty on your plate already. It’s not easy to change your personality without some serious work on yourself, and that’s where counselling can really help. Understanding why you do things is a great start to trying to stop them. Do you do things because you’re still trying to please your parents, even if they’re not even here any more? There’s no doubt that it’s easier to make changes when you’re in the good times, but it’s likely that you are only faced with these problems when things are getting out of control. Stress is a feeling of being unable to cope with the pressure upon you, so it’s a good idea not to put pressure on yourself and stop being so hard on yourself. 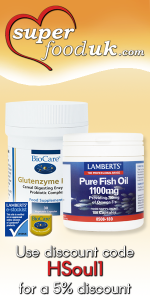 To purchase these products go to www.superfooduk.com and put in the promotion code: HSoul1 to get a 5% discount. Almost of half of women in the UK don’t get a good night’s sleep. * Sleep is a very precious thing and we only think about its quality when we aren’t getting enough. A key reason for not sleeping well is worrying. It keeps the brain whizzing round and round at night, while all we want to do is sleep. This month’s competition prize is for a set of Rescue Night products, that are invaluable when it comes to calming down and getting a good night. Go to: Rescue Night Competition. HEALTHY SOUL TIP: Wear earplugs if the person next to you snores!! Researchers found that the cells in the brain allow us to sleep are eroded as we get older. A study of 45 elderly people from the age of 65 until they died at around 89, found that people with fewer neurons in the ‘sleep switch’ area of the brain complained of sleepless nights. Few people realise the importance of a good night’s sleep – during the night while we are dreaming our bodies are healing themselves. We need sleep like we need healthy food, water, exercise and clean air. In a world full of technology, caffeinated drinks and plenty to worry about, many people spend their nights tossing and turning. Too little sleep makes you feel as if you can’t cope, and can lead to anxiety, depression and serious illness. 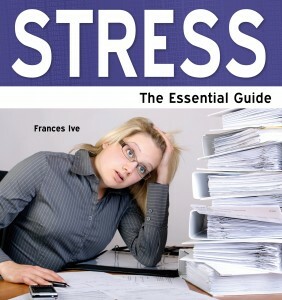 Read Stress – The Essential Guide by Frances Ive. • Wind down before bed time, play relaxing music or read. • Have a bath with a few drops of either lavender, neroli or geranium oil in them just before going to be. • Avoid stimulating films just before heading upstairs. • Take a natural sleep aid like Rescue Night or Good Night, which don’t leave you feeling drowsy like sleeping tablets do. Cut out caffeine in coffee, tea and colas – drink decaffeinated , coffee substitutes or herbal teas. • Don’t drink too much alcohol – it dehydrates you and disturbs your sleep. *Survey of over 4,100 UK adults, supported by the Sleep Apnoea Trust Association (SATA) and conducted by YouGov for ResMed Ltd. Put in the promotion code: HSoul1 at www.superfooduk.com to get a 5% discount! • Keep mobile phones off or out of the bedroom. • Don’t have an electronic clock right by the bed, and preferably not in the room – try a traditional clock. • Don’t have TV in the bedroom, and certainly not on standby. • Switch off computers and wireless networks at night. • Turn off electric toothbrushes, and anything in the bedroom with a little red light. There might be other reasons for not sleeping – such as menopausal symptoms or someone making a lot of noise snoring! Here are some ways you can practice mindfulness without meditating to improve a sense of wellbeing even while you are on the go. Take a few minutes during the day to just eat. Not multi-tasking lunch with conversation, the computer or phone. Just absorb the taste and textures of the food. Take in the smells. You’re much more likely to feel satisfied and nourished. Be aware of your movement, the contact with the ground, and the stretching and contracting of the muscles. Notice the sights, sounds, smells, temperature. This gives you respite and a break from negative thinking. 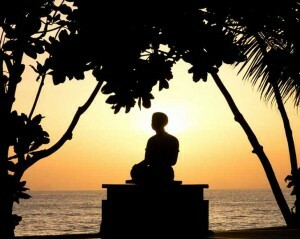 Paying attention to breathing can also slow down repetitive thoughts and worries. When the thinking slows down, there can be more clarity and creativity. Notice the air enter the body, the movement of the body as it breathes. Follow a full in-breath and a full out-breath. Repeat this a few times. Before automatically opening an email, answering the phone, or pushing the button in the lift… pause. Notice with full awareness the actions you are taking. This develops your ability to not just react unthinkingly. This is a valuable skill when you are under pressure. Open up fully to hear what someone is saying. Put on hold what you want to say next or any immediate judgements. Just take in the words. Listen with what you see and observe the tone, pitch, pauses, and expressions. This will give you much more information to find the right response. Getting out of your routine for a while can bring you back to your senses more. Do something new, such as trying a different type of coffee or tea in the morning, taking a slightly different route to work, or rearranging your desk or a room at home slightly.